Morgan Creek is pleased to have our cabinetry featured in the current issue (November, 2014) of Architectural Digest. The focus of the article is how people are using the kitchen (and pantries) for entertaining--not a surprise to anyone who’s been at a party where guests crowd around the island. It seems to be a natural magnet for people looking for food, drink, and convivial conversation. The house was designed by Atlanta architect Keith Summerour with assistance from Barbara Westbrook, a talented interior designer we have had the good fortune to work with on a number of projects over the years. 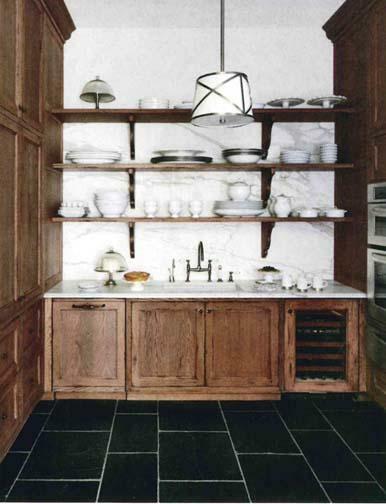 Unlike most designers, Barbara routinely details the interior woodwork for her projects, including the cabinetry. The kitchen is an inspired design by Barbara that combines patinaed oak cabinets with a classic old European feel and a stunning gray island that has a sculptural quality and confronts you like a crouching tiger. A serving pantry in the same patinaed oak and a formal butler pantry in an elegant deep gray with leaded glass panels were also featured. If you have a chance pick up the issue at the newstand or view the article on AD's website,read the interesting interview with Barbara Westbrook about how with the right touch a practical space can become surprising elegant.